Mourning the loss of his wife and the brutal murder of his best friend and chess partner, 77-year old Harry Brown decides to avenge his friend and take down the street gang responsible for his murder. Meanwhile, the British police begin a search for the man responsible for killing the gang member's murders. The first thing I have to do in this review is admit two things to my readers: 1. I absolutely love Michael Caine. 2. I absolutely love revenge thrillers like this and "Death Wish". Now that that is out of the way, our review can begin. 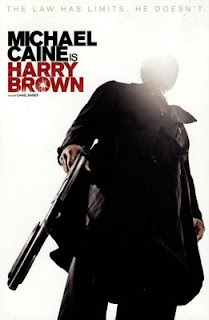 "Harry Brown" is awesome. I know that all these revenge thrillers offer nothing new and play out exactly the same every time, but these films are about execution (pun not intended). And this is exactly where "Harry Brown" succeeds. The obvious twist here is that our main character is not the first person you would peg to single handedly take down a young street gang, but Michael Caine is such an iconic and incredible actor he is the only one you could take seriously in this role. And holy cow is it serious. The acts committed by the gang in this film are absolutely atrocious and rooting for Brown becomes one of the easiest choices you will make while watching a film. Of course, the film tries to open up the debate on whether vigilantism is ever justified, but by the film's end it is more spectacle than actual social commentary. This actually works to the film's advantage as it does not come off as preachy or hamfisted and the action is believable, but not so realistic you are completely depressed by the end. Harry's brand of justice is certainly fun to watch, but a very clear distinction that this is just a movie is made early on and stays that way. The character of Harry Brown is intriguing and is presented in such a way that we know there is a history to his character, but the audience never quite figures out what that is and we are left to our own devices to figure it out. This is clearly a man who has seen things and Caine's riveting performance carries all of that through the defeated eyes he carries throughout most of the movie and through his quiet victory in the end. "Harry Brown" is no different than any other vigilante movie you are likely to come by, but as a fan of the genre it certainly executes itself very well with a commanding performance by the always incredible Michael Caine that makes you absolutely buy into a world where a 77-year old ex-royal marine will absolutely destroy you if push comes to shove. And for that, "Harry Brown" wins.